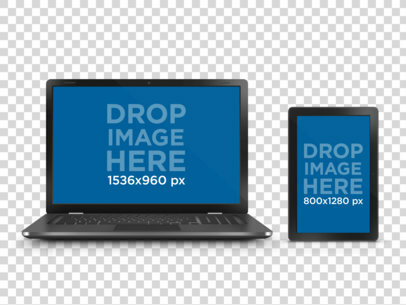 Use digital mockup to cut your budget and raise your brand awareness in no time! 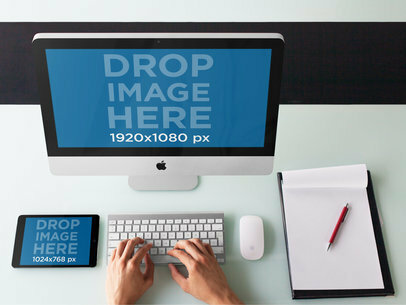 Try out this great responsive mockup featuring a MacBook Pro and iPhone in frontal view over a transparent background. 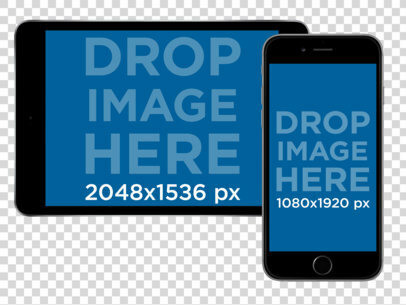 You can create all the mockups you need to promote your app with Placeit's easy to use mockup generator, why wait for more when all you need is right here! 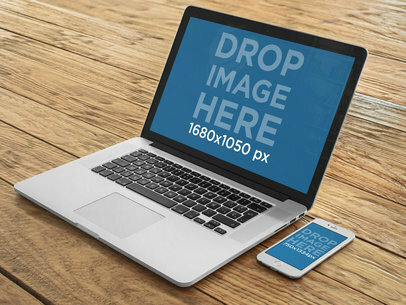 This is a beautiful shot of a Macbook Pro lying over a wooden table next to a white iPhone 6 in a portrait position. 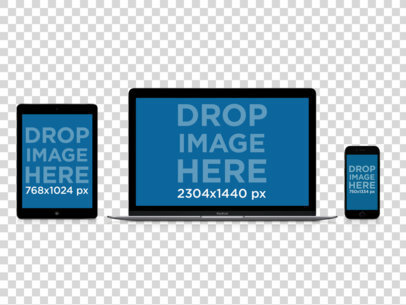 But it's not only a nice picture, this image is a mockup template you can use for your business' visual content as you will be able to showcase your new website and mobile app within the devices shown at the image, all you need to do is drag and drop a screenshot straight into the Macbook and the iPhone 6 and Placeit will deliver a compelling piece of app marketing! 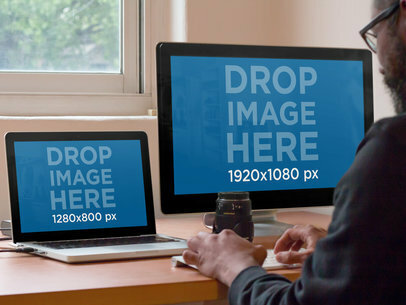 This multistage mockup perfectly represents how productivity and multitasking are one of the main characteristics of today's business environment. 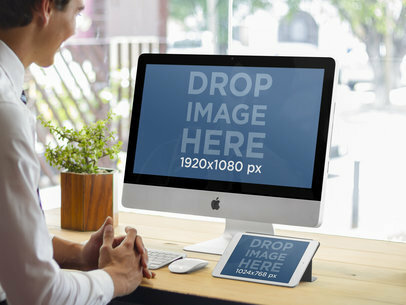 This iMac and iPad mockup features a handsome businessman using his white iPad in landscape position to stream a video or conference call while also reviewing business data on his iMac at the same time; he probably is even having a conversation with a coworker at the office, it is all about multitasking. The scene is set at a beautiful office and this man's desk is located next to a garden view window. 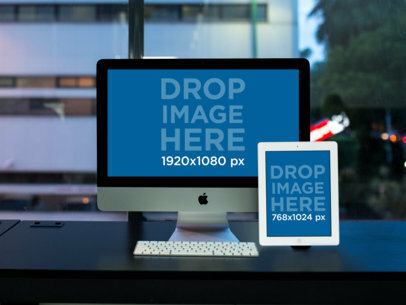 You can use this amazing iMac and white iPad mockup to display your new productivity app or mobile responsive website in a real life scenario that will provide your potential users an insight on your design and features while using the app. 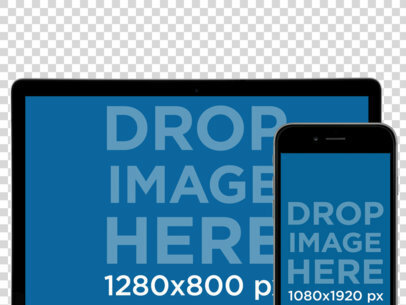 Just add your own screenshot to this multistage template and share the amazing final image with clients, users and business partners. 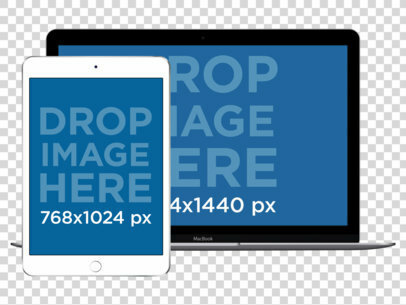 This iPad, Macbook and iPhone 6 mockup presents itself as the best scenario to display your new responsive app or website. 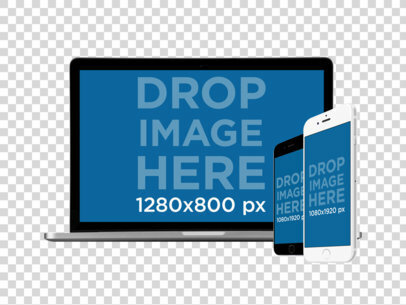 You can show off just how beautiful your design and features are by simply dragging screenshots directly into the screen of these top notch devices, or just type your URL. 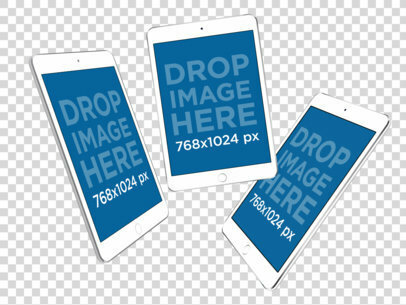 This apple devices mockup has a very elegant and sleek look, we can see the three devices perfectly aligned over a white background that creates a beautiful contrast with the shiny black surface of the iPad Mini, the iPhone 6 and the Macbook's frame. 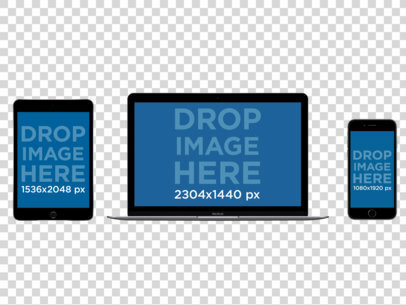 Give your app marketing strategy a twist by using apple mockups to display your new app. 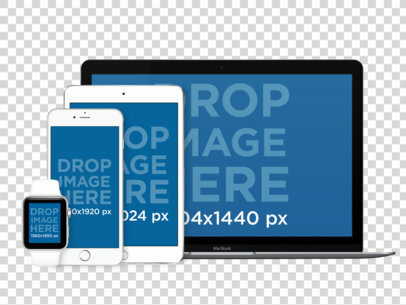 All you need to di is add your images to the mockup and your end result will be a beautiful image you will be able to share between coworkers, partners and most important, potential users! 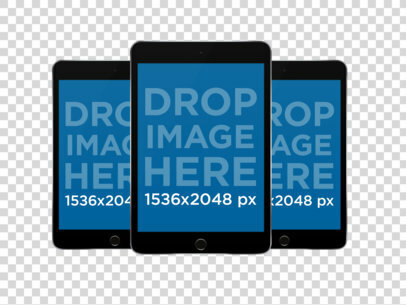 Start promoting your new app with this cool multiple device mockup featuring a set of 3 iPad minis in portrait front view. 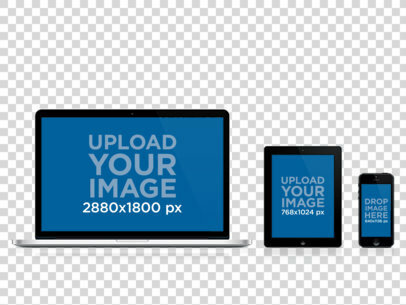 You can place your image on the placeholders to see how your app will look like in real life, it only takes a few seconds! 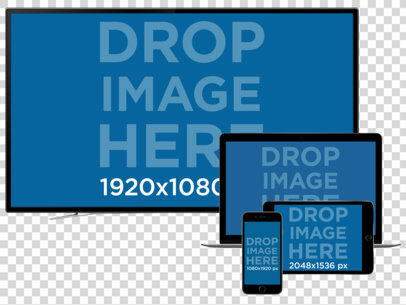 Download more digital mockups from our collection and update your advertising in no time. 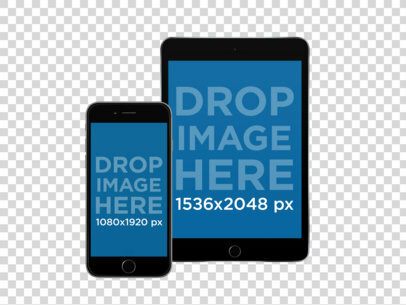 Get your app on this incredible digital mockup featuring a black iPhone and iPad mini in frontal view portrait position over a PNG background. 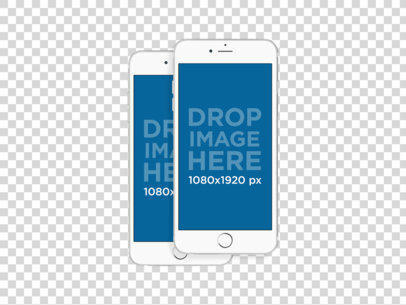 You can try out your app now on this mockup template by simply dragging and dropping an image of your choice over the placeholder and our mockup generator will have your download ready in no time! 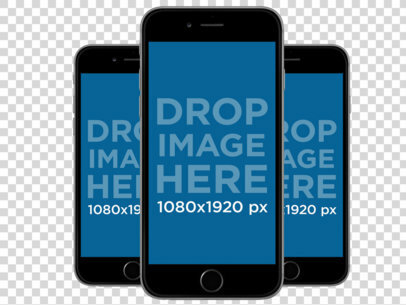 Don't forget to check the brand new iPhone 8 mockups! 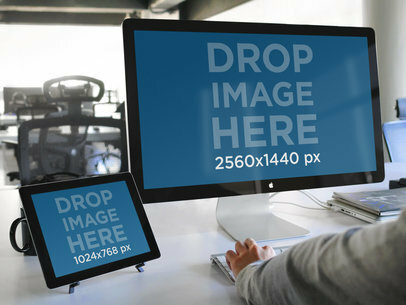 This mockup template features a Apple cinema display and an iPad. The iPad is on a stand and the cinema display is on a slight angle. Also in the stage, there is a macbook pro laid out to the side. 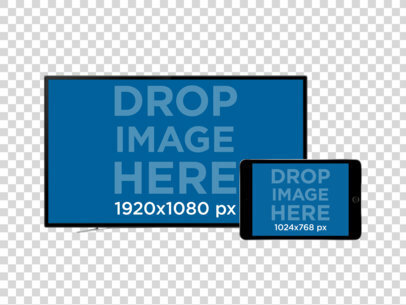 You can use both displays in this stage to show two different screens. 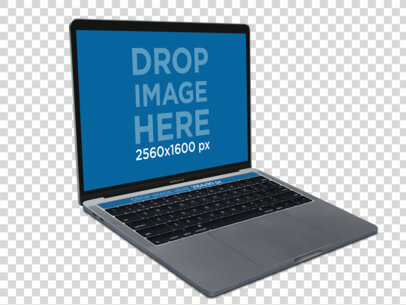 The user is using a bluetooth Apple keyboard and is wearing a grey sweater. The setting is perfect for a creative office space. 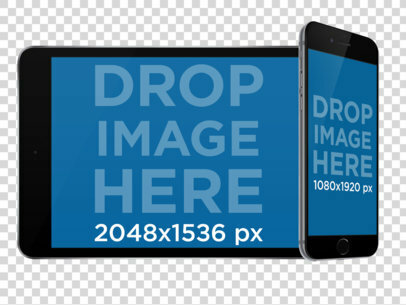 Give this digital mockup a try by adding one of your images over the mockup template and our mockup generator will let you see your app in real life! 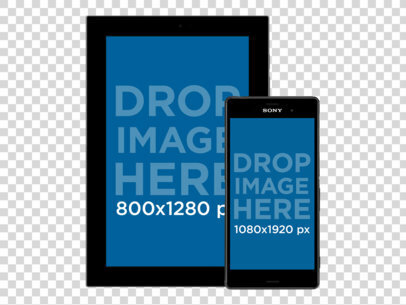 Try out more of our easy to use digital templates to promote your new app work in a more appealing way, your consumer's will love them and so will your budget. 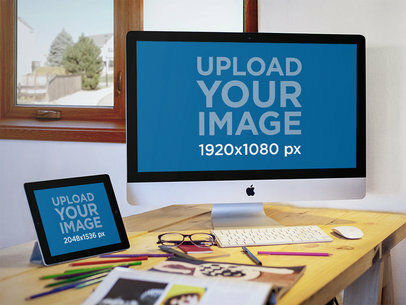 Start using mockup today and boost your advertising in no time! 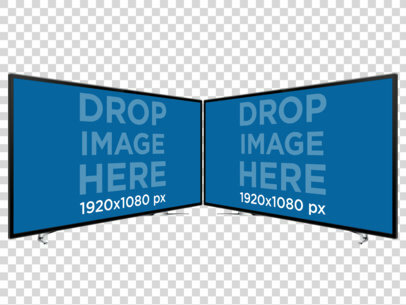 Double down on this two stage mockup! 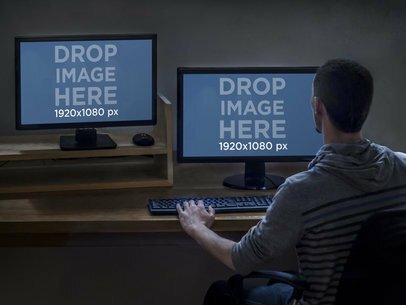 Place your product screenshots into these sleek computer monitors. 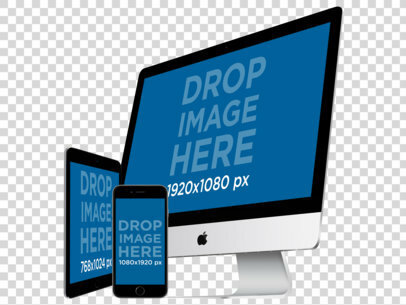 The larger stage is a 1920 x 1080 px iMac on a chrome stand with a streamlined, white keyboard. 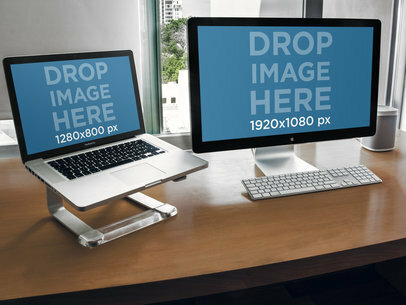 The smaller stage is a 1280 x 800 px Macbook Pro propped up on a chrome and resin stand. 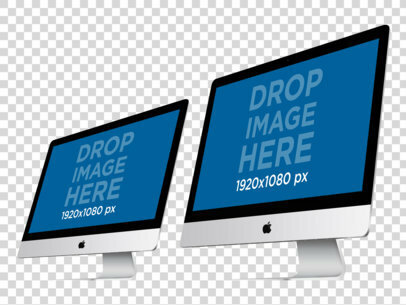 Both units are sitting on top of a brown, laminated desktop. Behind the Macbook is a window with a white screen pulled down. Behind the iMac is an open window with a city view. to the right of the iMac is a small, white speaker. 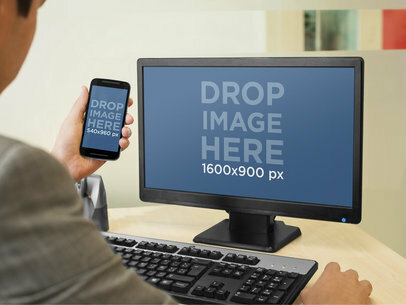 This excellent mockup can display two different views of the same product or two completely different products! 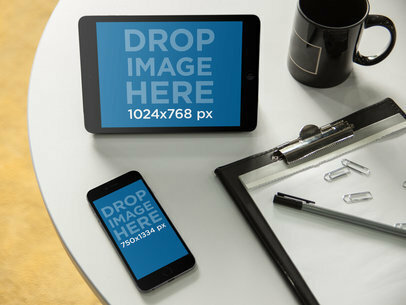 Take a look at this realistic iOS device mockup set complete with an iPad mini and an iPhone 6 Plus in angled portrait position over a PNG background. 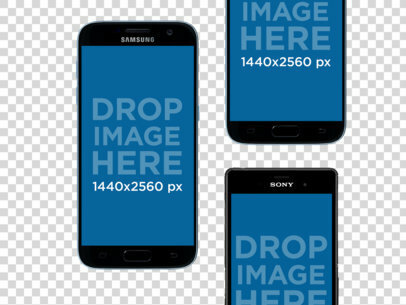 You can go ahead and customize the screens to display your app's features by simply dragging and dropping your images over the template. 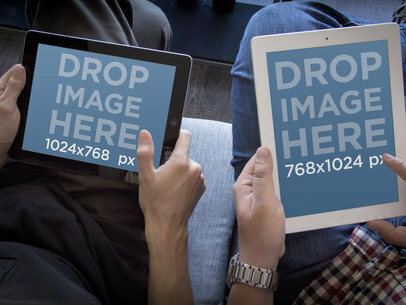 See for yourself and switch to photorealistic digital mockups to promote all of your new apps! 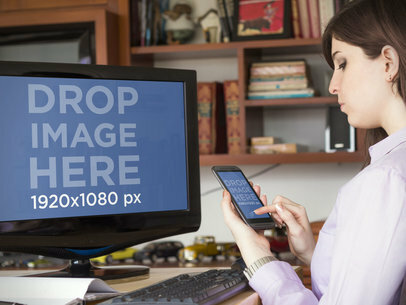 This is a beautiful multistage mockup that features a Macbook Pro and a white iPhone 6 Plus at a home office environment, the image has warm lightning, the Macbook Pro is set over a nice wooden table next to a small notepad, we can also see someone holding and using the iPhone 6 Plus in portrait position. 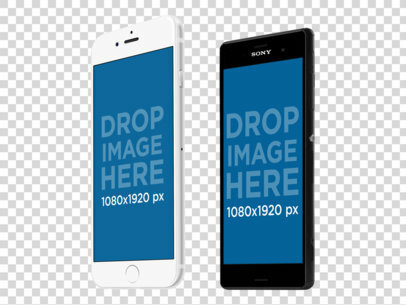 This mockup is great because it can be used in several ways, you can show off a website or app in both devices to compare the mobile and desktop versions, another great option is to display related apps or websites on these great apple devices. 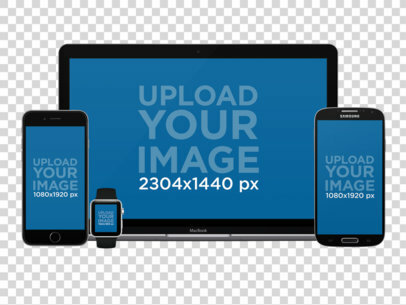 By choosing to share your app with mockups you will enhance your app marketing and increase your users and downloads, giving your product a great exposure. 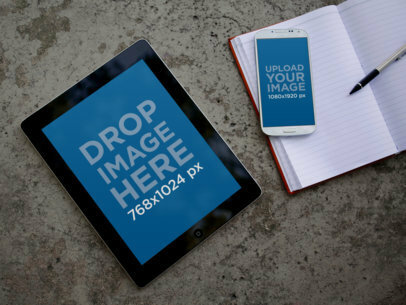 Just upload your best screenshots to this mockup and see how great the image composition merges with your own app. 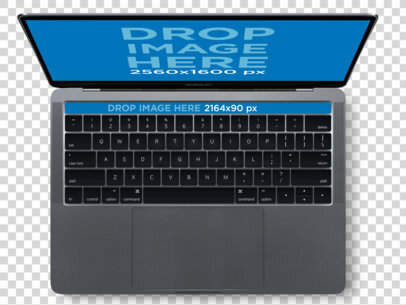 More Macbook Pro mockups here! 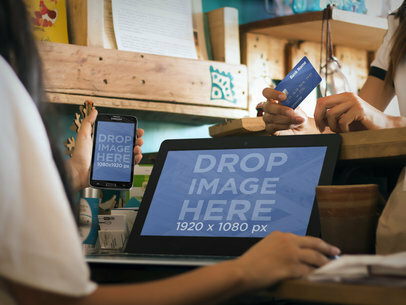 Nowadays it is all about being able to execute several tasks at the same time, being productive is one of the main characteristics of today's business environment. 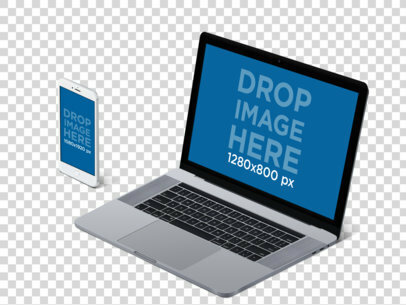 This mockup perfectly represents that as we can see a young man using his black iPhone 6 to make an important phone call while typing data on his Macbook Pro at the same time; he probably is even having a conversation with a coworker at the office, it is all about multitasking. 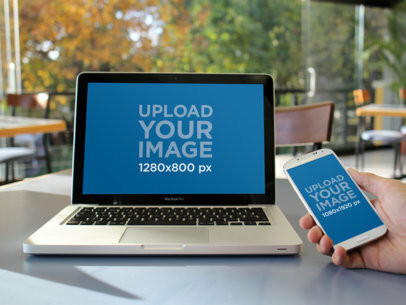 You can use this amazing Macbook and iPhone 6 mockup to display your new productivity app or website in a real life scenario that will provide your potential users an insight on your design and features while using the app. 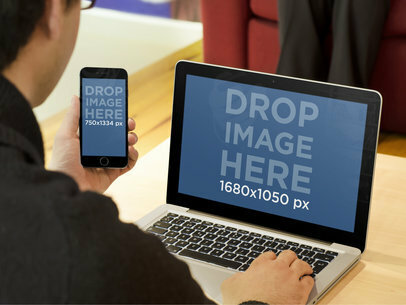 Take your app to the next level with photorealistic digital mockups curated by Placeit. 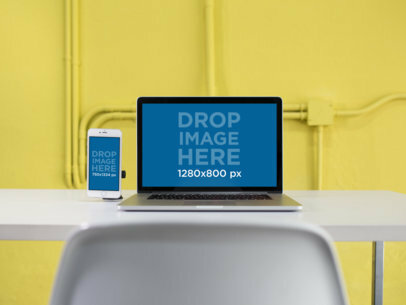 You can add your image right now to the screen by simply dragging and dropping your content over the placeholder, our mockup tool will immediately generate your download, pretty easy right? 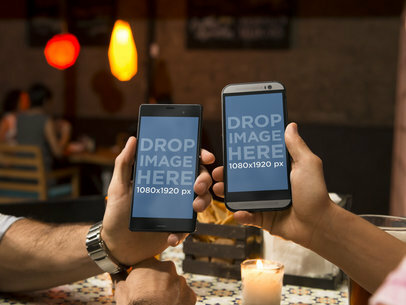 Use this mockup of an iPhone and Android phone in portrait position over a PNG background to start promoting your app!